See every stunning sight on Oahu from the white sands of Waikiki to the epic big waves of Norh Shore on our incredible 60-minute circle island tour. Get spectacular views from a guaranteed window seat of Diamond Head, Haunama Bay, the Ko'olau Mountains, Ka'a'awa Valley, Sacred Falls, Dole Plantation, and the USS Arizona Memorial. 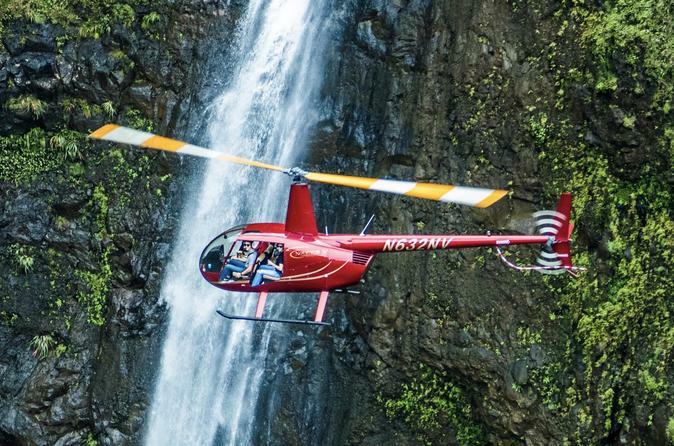 The island of Oahu is home to a wide variety of spectacular natural wonders best viewed from the sky on this royal tour. You begin with the heights of the Waikiki skyline along the sultry sands of the most famous beach in the Pacific. Oahu's crown, Diamond Head, pops into view presiding over the island known as The Gathering Place. As you pass over the ridges of the Leeward coast, Hanauma Bay appears below and gentle beaches transform into rugged volcanic cliffs, carved over millennia by sun, surf, and rain. You continue on this regal tour by flying over top of the charming Makapu’u lighthouse. The island’s Windward Coast awaits where you will see the incredible Ko’olau mountains standing watch above Lanikai Beach – often called the most marvelous beach in the world – and the offshore sandbars and coral formations that make Kaneohe Bay one of the most picturesque places on Earth. Fly past Chinaman’s Hat, and view with awe the succulent Ka’a’awa Valley before you. As the mountains approach, you fly in close to see the magnificent waters of Sacred Falls tumble over 1000 feet to the rainforest below. From there it is on to the world famous North Shore where you can see the surfers challenge the waves at Banzai Pipeline and Waimea Bay. You complete the circle of Oahu by turning inland and passing over the beautiful pineapple maze at the Dole Plantation. This incredible tour doesn't end until you have completed a solemn pass over Pearl Harbor and the USS Arizona Memorial.